On Thursday 23 June, 2016 Britons went to the ballot boxes to decide on whether to stay or leave the EU over growing concerns about sovereignty, fuelled by the rise of nationalism, the immigrant crisis and the failing functionality of a single market in the EU. Despite both Conservative and Labor party leaders assenting to remain in the EU, Britain voted for Brexit with England and Wales being in favour of leaving distinctly from Scotland and Northern Ireland backing of remaining in the Union. Following the referendum result, pound dipped against euro roughly by 12% and potential supervening impacts of the leave vote generated uncertainties over future prospects of UK economy. Including David Cameron, most major figures projected that in the case of an exit decision, we would say an instant economic crisis and a recession, causing a surge in unemployment, falling house prices and the government would be obliged to cut spending. On the contrary of these predictions, the UK economy added solid 2% to gross domestic production in 2016, unemployment continued to fall and inflation, which is acceptable to rise until a certain degree and is an indicator of growing economy, proved to settle on 2.3% in February. Very recently Tim Barrow, the UK’s permanent delegate in Brussels, handed over a letter from PM Theresa May to European council president, Donald Tusk, notifying her government’s intention to start triggering the Article 50 of Lisbon Treaty which entitles a right and defines the procedure for a member country to leave the Union. 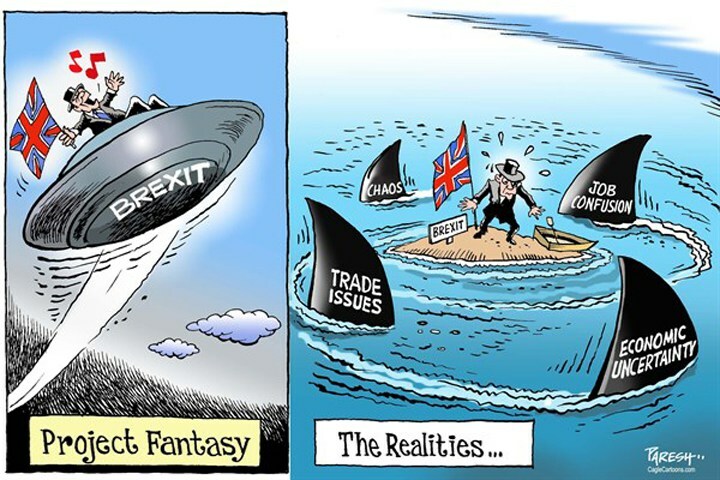 While the negotiations on terms and conditions of exit and future corporation with EU has started officially on March 29 which is expected to last as much as 2 years, the fortune of financial sector and impacts of Brexit on that remains uncertain and puts a question marks in minds. The regulation of banks in UK depends on 3 different set of provisions which 2 of them Capital Requirements Directive IV and the Capital Requirements Regulation (jointly CRD IV) and the Bank Resolution and Recovery Directive (BRRD) are the products of EU legislation. An entire exit from the EU would mean that the UK will no longer remain as a member of single market and will obtain a right to scrutinise these statutes and decide whether to pull down or retain some of its parts. A benignant rule of thumb is to consider the future corporation with EU and customise these legislations in order to maintain the present regulatory model and achieve a reciprocal recognition between the British and European regulatory authorities. Currently, UK domiciled investment funds exercise regulatory frameworks such as Undertakings for Collective Investment in Transferable Securities (UTICS) and Alternative Investment Fund (AIF). The significant issue for the UK asset management industry is the risks of changes to delegation rules enabling alternative investment funds and UCITS beneficiary firms to delegate to a UK based investment manager. Additionally, some risks might arise from tax acts of different EU member states which would make delegation to the UK less charming than it is in the present. In this particular again, the policymakers should pay attention to the post-Brexit regulatory systems which need to deem sufficiently equivalent amenities to enable delegation by EU firms to UK investment managers. Different Brexit Scenarios – What Could Be Next? Like Switzerland, the UK could agree a set of bilateral agreements enabling access to the single market, sector by sector. It would not get full access to the internal market but would also not be required to comply with EU law except in relation to exports and investments into the EU. Like Mexico, The UK could agree its own free trade agreement with the EU. This could lead to a single comprehensive deal rather than piecemeal agreements. Like Norway, the UK could rejoin the European Economic Area (EEA) and the European Free Trade Association (EFTA) and continue to have full access to the single market. It would have to adopt EU regulations and standards. After the referendum result UK Financial Conduct Authority announced that firms must continue to exercise the legislations derived from EU law. Hence, UK’s position as a full member of EU will continue until UK formally exits and therefore it still retains right to access Single Market. Even if UK can’t maintain its access to Single Market in the end of negotiations period, the third country provisions in MiFIR (Markets in Financial Instruments), the regulatory act by European Parliament, will be important and the equivalence of the UK regime will be a crucial factor in order to access European markets with a minimum cost.